It's known to all that Spotify is the most streaming music service in the world. Unlike other services, Spotify provides both free and paid plans. As to paid plans, Spotify also provides Premium for individual, students, family and PS4 users. Here we will introduce the milestones of Spotify user increase. And we will also introduce Spotify Music Converter which allows you to download Spotify songs, album and playlists as MP3, M4A, WAV or FLAC with both free and premium plans. Spotify is the most popular streaming music service, leaving Apple Music and other services behind. Spotify provides two tiers which are Spotify Free and Spotify Premium. There are some limitations of Spotify Free. 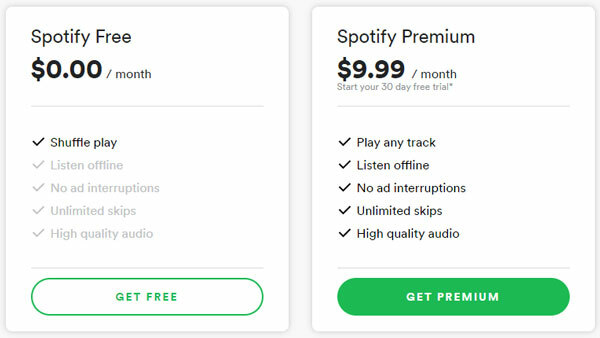 Below is a screenshot from Spotify's official website, which can help you to understand the main difference between Spotify Free and Spotify Premium. Spotify Free can only play songs in shuffle mode. Spotify Free users must have an internet connection and can't download songs for offline playback. Spotify Free have to endure the advertisement and there is no way to block. Spotify Free users can only skip 6 times per hour. Spotify Free stream songs in 160kbps while Premium is 320kbps. Spotify has covered a wide range of devices for users to listen. According to Spotify official material, Spotify supports following devices. Spotify also plays through several sound systems, TVs, and car stereo systems. But you need to contact your device’s manufacturer to determine whether it supports Spotify and, if so, how to enable it. However, Spotify Music is not available for many devices focused on music playback, like iPod Nano, iPod Shuffle, Sony Walkman and various MP3 players. Spotify Music is also not available for iPod Touch 4, Windows Phone, Nokia phones, BlackBerry, Windows XP/Vista, Mac OS 10.6 - 10.9, PSP and more. Spotify Premium users can download songs, but the songs are DRM-protected Ogg Vorbis format (*.ogg) and can't be converted to MP3 or M4A with normal audio converters. Spotify was launched on 7 October 2008 in Stockholm, Sweden. In March 2011, Spotify announced a customer base of one million paying subscribers across Europe. In September 2011, the number of Spotify paying subscribers had doubled to two million. In August 2012, Spotify had 15 million active users and 4 million paying subscribers. In December 2012, Spotify reached 20 million total active users including 5 million paying customers globally and 1 million paying customers in the United States. In March 2013, Spotify had 24 million active users including 6 million paying subscribers. In May 2014, Spotify had 40 million users including 10 million paying subscribers. In December 2014, Spotify had 60 million users including 15 million paying subscribers. In June 2015, Spotify had 75 million users including 20 million paying subscribers. In March 2016, Spotify had 40 million paying subscribers and 100 million total users in June 2016. In June 2017, Spotify had over 140 million active users and over 60 million paying subscribers in July 2017. In January 2018, Spotify annouced on Twitter it has over 70 million paying subscribers. In July 2018, Spotify annouced it had over 83 million paying subscribers and a total of 180 million active users. In November 2018, Spotify was reported 87 million paid Premium subscribers and 191 million total active users. In February 2019, Spotify hit 96 million paying subscribers and 207 million total active users. Because of the limitation of Spofity Free, and the DRM protection of the downloaded songs from Spotify Premium, Spotify subscribers always encounter the problem that there is no way to enjoy their favorite Spotify songs on music players dedicated to music playback, like iPod Nano, iPod Shuffle, Sony Walkman and all kinds of MP3 players. Besides, Spotify songs can't be burned to audio CD or MP3 CD, or used as background music in various video editors or DVD/Blu-ray creators. The best solution for these problems is TuneMobie Spotify Music Converter. TuneMobie Spotify Music Converter can download Spotify songs, albums and playlists to computer and convert to MP3, M4A, WAV or FLAC. All music information like song title, album, artist, genre, track number, artwork, etc. will be preserved. The most important thing is that TuneMobie Spotify Music Converter totally works with both Spotify Free and Spotify Premium, so you don't have to pay for the premium service first. 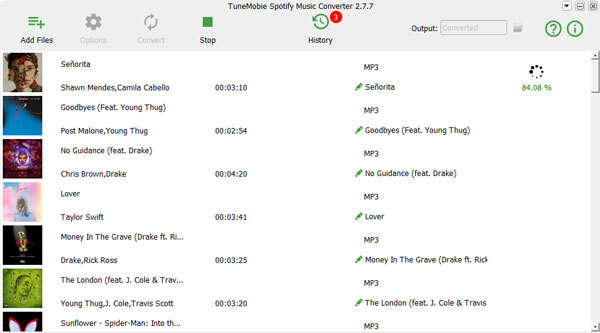 TuneMobie Spotify Music Converter is fully compatible with latest Windows 10, Mac OS X and Spotify. The Windows version also allows you to download and convert Spotify songs at 5X faster speed. The free trial version allows you to convert 3 minutes of each song. It's recommended to all Spotify subscribers to download and have a try. Spotify Music Converter is very easy-to-use. You can easily convert your favorite Spotify songs, albums and playlists to MP3 or M4A in only a few clicks. Please follow the steps below. Step 1: Launch Spotify Music Converter and Spotify will be automatically launched as well. Do not close Spotify during the conversion. Step 2: Click "Add Files" button. Drag and drop Spotify songs, album or playlists to Spotify Music Converter, or copy link in Spotify and paste in the blank area in the left bottom. Step 3: All songs will be listed. If necessary, uncheck the songs you don't want to download. Step 4: Choose output format. Spotify Music Converter uses 320kbps MP3 as default output format. If necessary, you can click Options to change output format, output folder and bitrate. Step 5: Click Convert button to start conversion. All the converted songs will be listed in History. 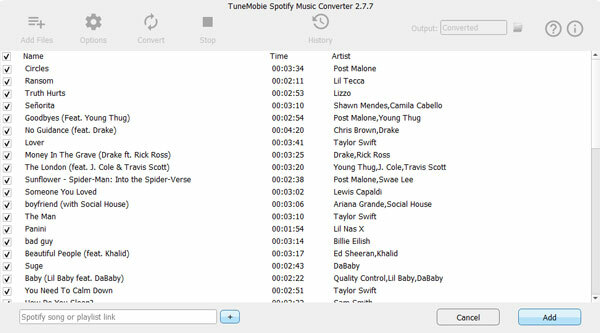 TuneMobie Spotify Music Converter is a must-have software program for all Spotify subscribers. If you are also using Spotify, either free or premium, do not hesitate to download Spotify Music Converter to have a try now.